Perry T. Jones and a literal depiction of his pawns. Could it be that one man, and one man alone, could thoroughly and completely dominate and control an international sport for nearly four decades? The answer is yes. The sport is tennis. The man was Perry T. Jones. In his youth, Jones was an avid and respectable tennis player. 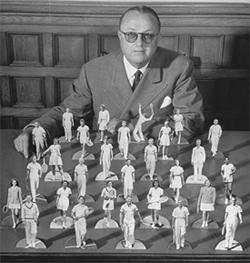 However, his devotion to the game evolved into a burning obsession to achieve complete control of the sport. A formidable and unlikely goal, but one he succeeded in reaching. Ed Atkinson is the producer of Kings of the Court, the amazing historical video that presents intimate profiles of some of the greatest players in tennis history. Kings of the Court features rare and often never before seen footage of players including Big Bill Tilden, Don Budge, Jack Kramer, Lew Hoad, Pancho Gonzales, and Rod Laver, narrated by John Forsythe with an original musical score. Atkinson, a former top college player, is a lifelong member of the Los Angeles Tennis Club, where many of the "Kings" trained and competed in the glory years of amateur tennis.